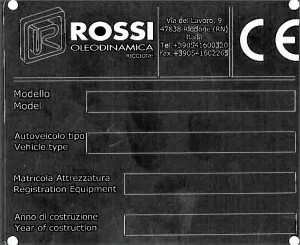 Spare parts - Rossi Oleodinamica S.R.L. When a vehicle has such a long life, it is not easy to find spare parts. The same parts are not always available. Most of the time you can find similar parts but have trouble adapting these to the vehicle structure. This forces you to spend a lot of money and time to readjust the machine and make it work properly. We know how this can be annoying, so our equipment is designed by studying each single component. Our spare parts service is so well organized and consolidated that we canfind you a part even after many years. With the necessary technological upgrades, but without distorting the structure of the vehicle. Of course, we realise how valuable YOUR time is, so that’s why we dispatch everything within 24h* wherever you want it. Just the time needed to complete packaging. All this to offer you a purchasing experience without stress and hassle.